EPA officially launched its national system for tracking hazardous waste shipments electronically on June 30, 2018. This system, known as “e-Manifest,” was anticipated to modernize the cradle-to-grave hazardous waste tracking process while saving time, resources, and costs for industry and states. The e-Manifest system is expected to impact approximately 160,000 entities who generate, transport, and manage hazardous wastes across the nation. Although strongly discouraged, the use of paper manifests is still allowed for generators and transporters of hazardous waste, with the burden for compliance with the e-Manifest system primarily falling onto receiving facilities. By now, all receiving facilities of manifested hazardous wastes must be registered and utilize the e-Manifest system by entering each manifested shipment into the system or mailing a paper version to EPA for manual data entry. As of late 2018, over one half million manifests were already entered into the e-Manifest system, with many thousands more paper manifests awaiting entry into the e-Manifest system by EPA staff. The e-Manifest fees are primarily the responsibility of receiving facilities and range between $5 (for electronic submittals) to $15 (for paper manifests mailed). EPA is not charging user fees to generators, transporters, or brokers as user fees will be only assessed to receiving facilities for each manifest submitted. The receiving facilities responsible for payment of e-Manifest fees will receive an electronic copy of their invoice on the first day of the month after manifests were submitted to EPA. Facilities then must pay their invoice in full within the same calendar month it was received. The roll-out of the e-Manifest system has not come without it’s issues, as industry representatives and the regulated community initially struggled with utilization of the system. This has been especially true for receiving facilities, many of whom had not completed the necessary modifications to their software systems to properly integrate with e-Manifest. 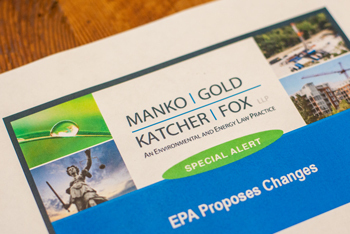 This has prompted some receiving facilities to simply mail paper manifests to the EPA for manual entry by EPA staff, thus resulting in the larger e-Manifest fees being passed onto their generator customers. EPA plans to continue its outreach on the e-Manifest system through a website, webinars, stakeholder meetings, and other methods. The agency has also been helping states, including aligning state manifest practices with the new system, adopting the federal rules, and engaging regulated entities.